I was so glad to reach the Sea of Galilee because the weather in Israel in summer is very hot! The water was cool and clean, and I could swim amongst the rocks. If you want to know why I became so hot, please see the other photos below as I was very busy in Israel. Relaxing at the Sea of Galilee before my swim! 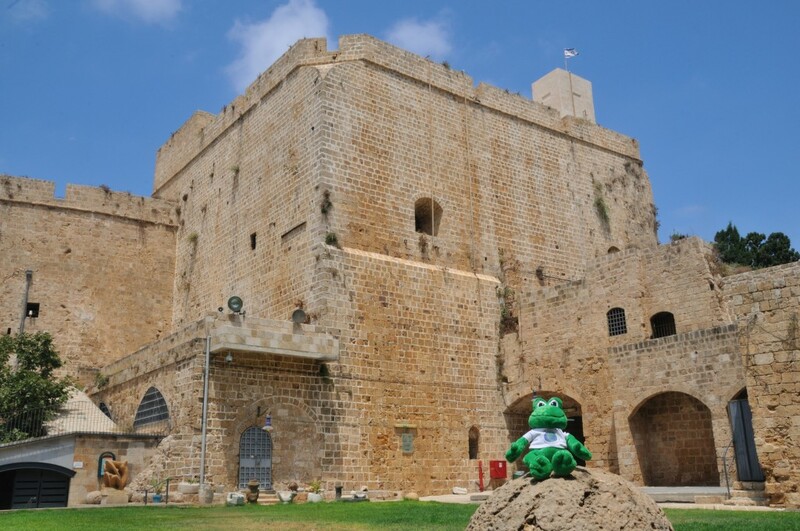 The first stop in Israel was the city of Akko, the city is 4000 years old, which means that there have been many generations of frogs hop around the planet since Akko was founded! 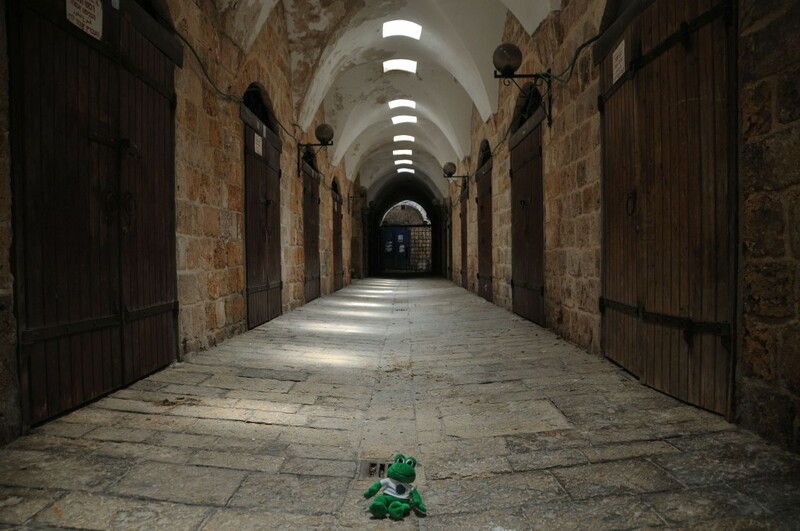 The best part was the Akko Citadel and the Underground Crusader City. There was an old underground sewer that was also used as an escape tunnel. 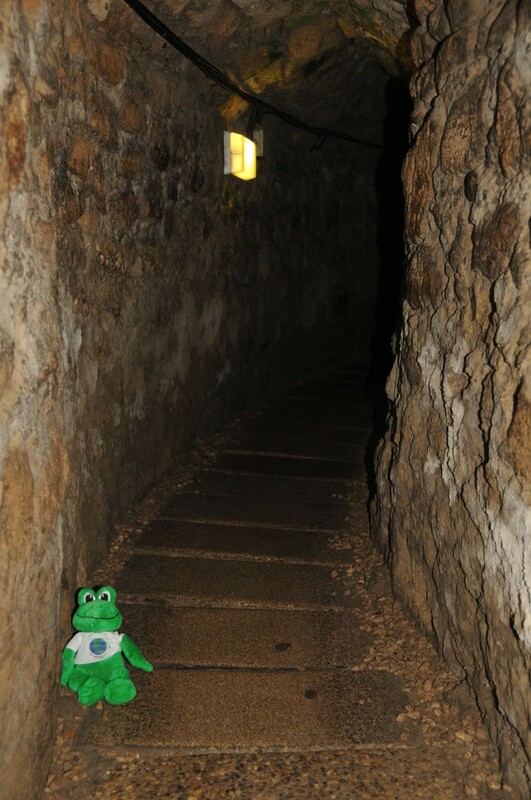 It was very dark and long, and being a little frog, I actually looked bigger than normal when sitting in it. Shane is taller and he had to crouch through most of it. There were many beautiful streets and alleys in Akko and this one was very nice because it was not in the sun, so it was cooler inside. After seeing Akko we leapt onto a bus and travelled to the religious sites in the north part of Israel. Shane told me on the bus that religion is very important to many people and even if we do not understand or worship a religion, we should still treat it with respect. 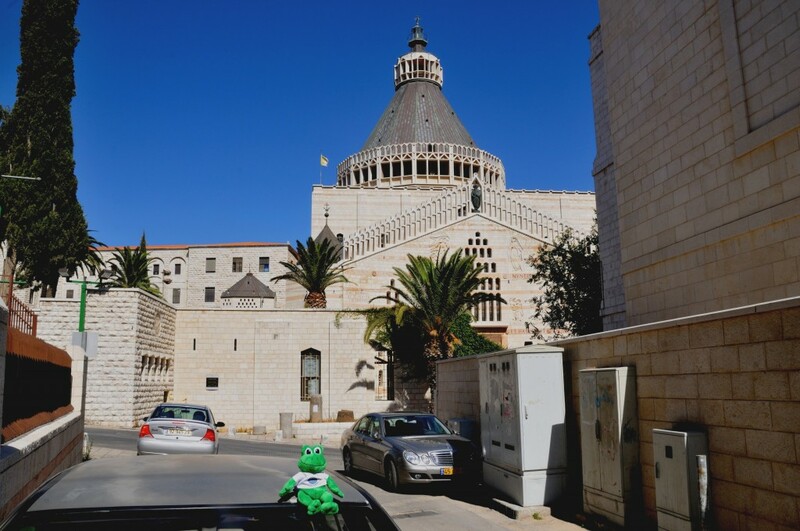 In Nazareth, we saw a very large church called a basillica. Its name was the Basillica of the Annunciation which is supposed to be where a lady called Mary was visited by an angel called Gabriel who said she would give birth to a baby called Jesus. This Basillica was very special for people as some of them were so happy that they would cry when entering the building or when they would sing songs called hymns. 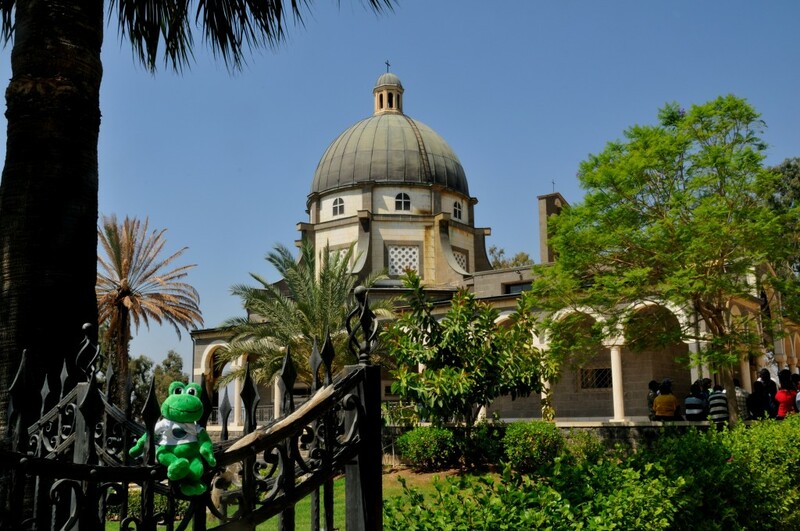 Afterwards, we travelled to the Sea of Galilee, and here we visited Shane’s favourite place. It is called the Mount of the Beatitudes and it is where a speech was given by a person called Jesus that blessed the mourners, merciful and meek. Shane explained it to me, but I didn’t understand it very well. Jesus is the same man who I was told about at the Basilica in Nazareth. People from all over the world were there – from Europe, North America, South America, Asia, Africa and Australia – so it must be very important. The gardens were beautiful, so I spent a lot of times on the bushes, trees and fences while Shane took photographs. 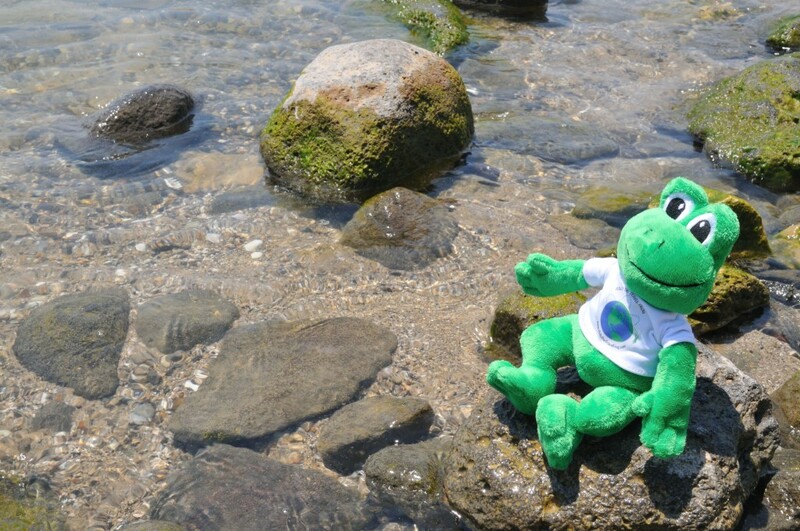 After seeing all of these things, I was very hot, so was very pleased to swim in the Sea of Galilee! This has been a very interesting time as I am learning many things and meeting many people from around the world. 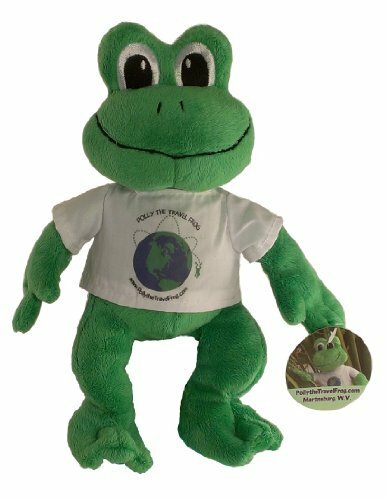 I am a happy frog! The sky is so blue in your pictures. Very beautiful. Great post. I had never heard of Akko. I learned a lot. Greta post! I love the pictures! I love the blue sky in your pictures, when do we get nice weather like that again??? Great post Polly #7. I would love to visit there sometime and these pictures make it look even more amazing. Great information and pictures! The skies were always blue because it was summer, but when it was very hot, the skies looked more hazy. I bet Polly really liked swimming in such a famous place!